Roy Chomko, CEO of Adage Technologies reports that “While executives eagerly shell out thousands of dollars for an app’s development and launch, too often they fail to forecast the ongoing costs of maintaining a mobile application.” If this is true, then what additional effort, time, and expense should B2B marketers or sales executive anticipate? In order for a company to be successful in their mobile marketing and sales enablement efforts, their apps must provide useful experiences for all of the constituents in the go-to-market ecosystem. This includes marketers, sales team members, channel partners, and most importantly, prospects and customers. A myth popular amongst many marketers is that developing mobile apps is cheap and easy. But remember, a B2B app is an “enterprise” application, and requires a variety of professional-grade characteristics in order to be useful. The process of developing an enterprise app, must still start with a spec, have a design phase, a user interface/user experience component, and must also include testing and QA. One study, commissioned by Dr. Tim King, CTO of 5app, shows the cost of an app increasing by a factor of between 2.5X and 3X when apps are built for three supported platforms as compared to just one. Incidentally, in this same study, the coding part of the development cost was just 50% of the true cost of development, once design and testing was accounted for. Another study, performed by Propelics, revealed that the median development cost of a “medium” complexity B2B app was $100,000. A B2B app must be deployed to all potential users in the most efficient and effective manner. This often does include the Apple App store, but also might include the Google Play Store for Android, a Mobile Device Management (MDM) system for internal enterprise deployment, a company’s private “app store”, and placement on other app marketplaces (such as the Kindle app store). But simply putting the app into the store, or making it available in a company’s MDM system does not actually deploy the app to the devices belonging to the intended users. Those users must still know where to go (depending on their device and operating system) and they must find the specific app via a link or search. For global companies, this issue is far from straightforward. Recognizing that similar types of users (say, sales representatives) will need the app in a variety of geographic regions, and that users in these regions may have different devices, places a burden on the developers to ensure that all required devices are supported. In the world of sales and marketing, it is not enough to limit support only to the variety of tablets and smartphones for these users, because many sales personnel use PC’s. (Laptops are mobile, too.) Assuming that the app could be made to work on a PC, the question remains, how to get the app onto those users’ PCs? In many ways, a B2B mobile app is similar to an automobile. Once the product has been paid for, there remains a continuous requirement to “feed” and maintain it – gas for the car, periodic oil changes, brakes, tires, windshield wiper replacements, etc. Depending on how the app is developed, it will require updates whenever operating systems are updated, new operating systems are released, new device types and sizes become available, and even when new versions of web browsers are released. In 2013 alone, there were dozens of upgrades and bug fixes to iOS and Android operating systems, requiring apps to be updated and modified to accommodate these operating system changes. In the four-month period from Sept. 18, 2013 through Jan. 29, 2014 Apple released six different versions of iOS 7. Estimates by MGI Research show that mobile apps will require at least four major update cycles stemming from operating system and device updates over an 18-month to 24-month period. And that’s just for one operating system platform (e.g. iOS.) According to the AnyPresence 2013 Mobile Readiness Report, more than 80% of B2B apps are updated more than twice a year, and fully 33% of B2B apps are updated every month. 1. Ensure that the app is truly interactive. The vast majority of B2B sales and marketing apps are tablet-based versions of slide presentations, videos, and brochures. These are not going to be more effective simply because they are used on a touch screen device. Instead, engage with the end user on a sensory level, and create an emotional connection, keeping in mind that your user is going to choose which aspects of the application to explore, and in what sequence. 2. “Mobile first” does not mean “mobile only:” Consider making your app available not just to tablets and smartphones, but as a standalone app for desktop computers and as a browser app running on the web. 3. Online and Offline: In the B2B world, sales and marketing teams often encounter customer-facing venues where access to the Internet is limited or simply not available. Make sure your app is fully functional whether or not the device is connected to the web. 4. Immediate updates: Whenever a content update to the app is made, have the change is distributed incrementally (i.e. only the new or modified part) to every user’s local app – from one central cloud location – so that ALL users have immediate access to the very latest version of interactive content the next time they are connected to the web. 5. Engagement analytics: Don’t merely track how many people have downloaded your app. Rather, track how your app is being used, to see how engaged your users are with each section of the app, where the users are globally and what devices they are using to access the app. 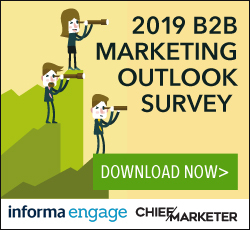 B2B apps for sales and marketing have already proven to yield significant opportunity for improving sales effectiveness and marketing efficiency. Creating transparency around the entire process, from development through deployment and maintenance will dramatically improve the likelihood of sustained success. Gavin Finn is president and CEO of Kaon Interactive.